Photo: PATH/Chimwasu Njapawu. 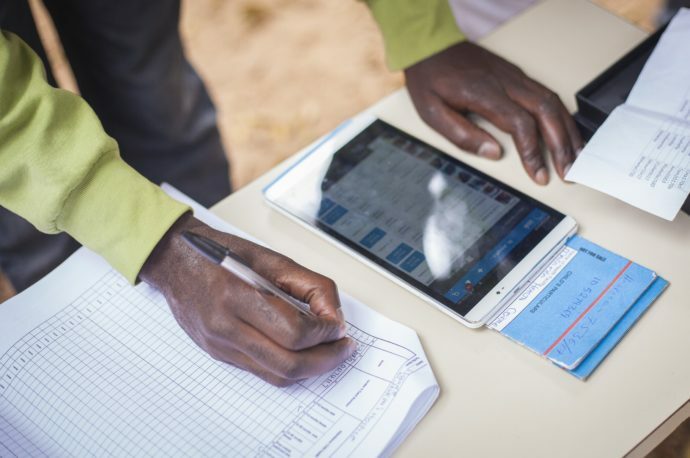 A health worker checks immunization data on a tablet. This blog series launches the BID Story, and recounts our journey to design, develop, and implement data quality and use interventions in Tanzania and Zambia between 2014 and 2018. Matt Berg, the CEO of Ona, a Nairobi- and Vermont-based technology company, remembers one of the first immunization clinics he witnessed in Livingstone, Zambia. As a long queue of patients waited to be vaccinated, three health workers and one community health volunteer busied themselves with that day’s work. The community health volunteer weighed children, placing infants into a hanging canvas scale. Two nurses sat at a desk, immunization-related papers fanned out before them. As one pored over a paper registry, the other recorded data on a tally sheet and updated the child’s immunization card. A third nurse administered vaccines inside the clinic. Matt couldn’t help but wonder what could be done to allow the small cadre of health workers to spend more time with patients, instead of administrative tasks. A more streamlined immunization process would make for shorter wait times and a more meaningful exchange between patients and nurses, and it would free up the workers’ time for other critical clinic tasks. Despite global progress, one in five children worldwide still lacks access to lifesaving vaccines. The missing “fifth child” refers to the hardest-to-reach children in these communities, an estimated 20 percent of children globally, that health systems are chronically missing. Digital systems are increasingly seen as a solution to help locate and immunize these vulnerable children. To read the full profile, visit the BID Story.